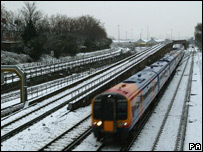 Heavy snowfall in much of England and Wales has closed schools and left travellers battling transport problems. A number of airport runways were closed with flights cancelled, while train services have also been affected. Thousands of schools are shut and motorists are being urged to travel only if necessary. Some households are also without power. Up to 10cm (4in) of snow fell in some areas. 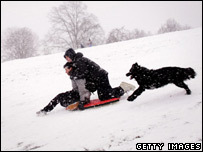 Leader of the Commons Jack Straw admitted the UK coped badly with snow. Amid calls for a parliamentary debate on the weather, Mr Straw told MPs the country needed to be better prepared for a cold snap. He said: "It is extremely important we upgrade our efforts all the time to defy the weather which after all, not withstanding a day's snow, is much more moderate than many other countries who frankly are able to cope a bit better." Severe weather warnings have been issued for Wales, the Midlands and the south-east of England. Much of the snow across central and southern England, including London, coincided with the morning rush-hour, before moving north-eastwards. The deepest snow recorded so far is Sennybridge, in the Brecon Beacons, which has seen 10cm (4in) fall. Some hilly areas were likely to receive up to 15cm (6in) of snow during the day, the BBC Weather Centre said. Northern Ireland has seen a mixture of rain, sleet and snow. However, the south-west of England has avoided the bad weather and much of Scotland remains dry and sunny, forecasters said. 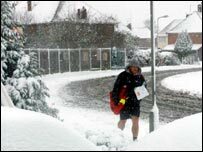 Hundreds of schools across the south-east of England, the Midlands and Wales have been closed as a result of the weather. All schools in Birmingham will remain closed on Friday, as more snow and icy conditions are expected. A spokesman for the Local Government Association said the primary concern was the safety of the children. "If parents feel they don't want to compromise that by getting into the car or by walking on ice, that's fine," he said. Hundreds of householders in Abergavenny, south Wales and Llandeilo and Blaenporth in west Wales have also been left without power. Meanwhile travellers faced disruption on the roads, public transport and at airports. The runways at Gatwick, Stansted, Birmingham, London City, Cardiff, Bristol and Luton airports were closed because of the severe weather, but have now reopened. The runway at Norwich Airport is still closed. Some short-haul British Airways flights from Heathrow and Gatwick airports were cancelled. Scottish airports remained open, although some flights were cancelled. The Highways Agency urged motorists to travel only if necessary. A spokesman for the AA's Roadwatch service said motoring conditions had been worst in the south-east of England as well as south Wales. On the railways, Virgin Trains First Great Western, Midland Mainline, South West Trains and Southern Railways services have been disrupted. London's Tube services were also affected. Industry chiefs have warned the transport problems could cost the country's economy. David Frost, director-general of the British Chambers of Commerce, said: "It is expected that the lateness and loss of work hours caused by transport disruptions will cost the British economy up to £400 million." BBC forecaster Penny Tranter said that at 1200 GMT the snow was moving northwards, although it was "losing a bit of its oomph". "There's still some coming into southern parts of Northern Ireland, Lincolnshire, South Yorkshire and the Manchester area, but it's nothing like as substantial as we've seen further south," she said. Snow warnings are expected to turn to warnings of widespread icy conditions later on Thursday. The outlook is set to improve on Friday in most areas, with rain in the South West, while most other areas are forecast to be cold and mainly dry. However, more snow has been predicted for Saturday in central and northern England, as well as some parts of Scotland, and there may be further snowfall in Scotland on Sunday. The Highways Agency is advising drivers to check weather forecasts and road conditions before they set out. People who must travel are advised to take warm clothes, food, water, a torch and a spade. How has the snow affected you?